Bike share has arrived in Milton at last! You may have used bike share systems like Hubway in Boston (now known as Blue Bikes) or ofo in Quincy. The Town of Milton has partnered with over a dozen local communities to bring rental bikes to your neighborhood. Bike share is basically a bicycle rental service. The bikes you'll find in Milton are 'dockless' bikes, which means that unlike Boston's bikes, you don't have to go to a docking station to rent or return a bike. Each dockless bikeshare bike has a GPS receiver and a lock built into it, so you can find the nearest bike using a smartphone app. It may seem odd to see a bike just sitting outside, not locked to anything, but it is not abandoned - it is locked, just like a rental car might be. To use a bikeshare bike, you will need the smartphone app, and you'll need to set up a credit card for billing. Look at the app's map to find the nearest bike. When you find the nearest bike, scan to unlock it - either take a picture of the bike's QR barcode, or enter the bike's ID number into the app manually. The lock will automatically open, and you can set the seat height to fit you and then bike to your destination. When you are done with your ride, place the bike in a public area so that it is not in the way, and manually slide the lock closed. The bike will send a signal and you will be billed for the trip, typically $1 per half hour (electric-assist bikes cost extra). Lime also offers more cost-effective monthly subscriptions and student rates. There is also a low-cost Lime Access program for people with limited incomes. Soon you will be able to find Lime bikes at local parks and train stations. They are also available (or soon will be available) in Quincy, Newton, Needham, Watertown, Waltham, Belmont, Arlington, Bedford, Medford, Melrose, Malden, Everett, Chelsea, Revere and Winthrop. You may take a Lime bike into Boston, but they do not have an agreement to operate there, so the bike may be relocated back to Milton if you leave it in a Boston neighborhood. You can find the Lime bike app on the Apple and Android app stores. You may also see green Ant Bicycle bikeshare bikes in or around Milton. They do not have a contract to operate locally, but if you find one you can use it the same way as a Limebike - but you would have to use the Ant Bicycle app instead. Blue Bikes has announced that they will bring their bikes to Mattapan and Dorchester later this year, but they must be returned to a docking station in Boston. What to do if a bike is improperly located on private property, or in the way on a sidewalk? You can move it yourself. If so, place it out of the way on public property, such as the edge of a sidewalk or in the space between the sidewalk and the road. Alternately, you can have the company remove the bike. First, identify the brand - Lime bike or Ant Bike, then reach out to the vendor, identify the location of the bike, and ask them to relocate it. 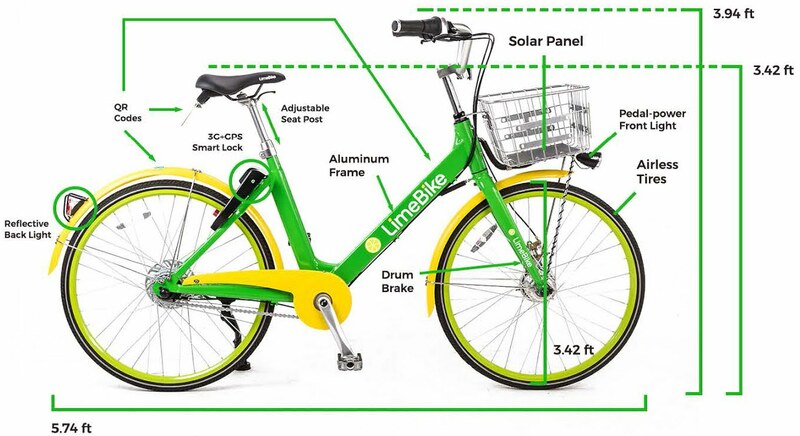 Limebike should respond within a day; Ant Bicycle does not have a contract to operate in town, so they may not respond as promptly. A GPS-enabled smart lock that locks the rear wheel so the bike doesn't need to be locked to a bike rack. QR codes (2-D bar codes) unique to each bike. You scan the barcode with the smartphone app to unlock the bike. The seat is adjustable for your riding comfort. Just pull the lever under the seat and adjust the height. The basket can carry your bag, groceries or other items. It has a solar panel in the bottom to power the GPS, lock and taillight. Front and rear lights for you to see and be seen, are automatically activated when the bike is in motion. The rear light is powered by the solar panel and battery, and the front light is powered by a generator in the front wheel. There is a bell in the left hand grip. Let people know you are approaching by twisting the grip. The bike has three speeds to help climb hills or to ride faster. Select gears by twisting the right hand grip. Download the Lime smartphone app to your phone. The app is free, but if you want to use a bike, you'll need to enter billing information. Discounts are available for regular commuters, students and people with limited income. You can find the nearest Lime Bike using the app's map. When you find a bike, tap "Scan To Ride" and take a photo of the QR code or manually enter the bike number. The bike will unlock and you can go for a ride. When you are done, you can park the bike out of the way in a public place. Ideal parking spots are near bike racks, or at the edge of the sidewalk. In residential neighborhoods, you can use the space between the sidewalk and the road, but the bike may not stand on grass, so you might lean the bike against a utility pole. Please be a good neighbor and take care not to block a sidewalk with the bike. Be sure to manually close the lock when you are done with your ride - you will be billed for the trip when the lock is closed, and if you don't close the lock, you will be billed for extra time. When you complete your ride, the app will show a ride summary with distance, time, carbon savings and calories burned. Bike share is a transportation service that provides bikes for rent at low cost. Bikes are faster than walking to the train station, and they can save you money on parking. Depending on traffic, a bike can be as fast as driving. And when using a rental bike, you don’t have to worry about maintenance or theft. Each bike is equipped with lights for visibility, a basket to carry some belongings, gears to help you climb hills, and a bell to alert other people when you are passing them. Mostly commuters. Data from local systems show that most rides are taken during the morning and evening rush hours. The Blue Bikes system in Boston, Brookline, Cambridge and Somerville is used for over 7,000 trips per day. Of course, bike share bikes can also be used for recreational rides, but because they are made to handle a lot of use and the weather, they are heavy and aren’t as sporty as most personal bikes. Dockless bike share systems use smartphone apps. Download the app, create an account, add a few dollars of credit, and when you want to go somewhere, look up a nearby bike using the app. Each bike has GPS and a transmitter built-in, so you can find it on the map. Walk up to the bike, scan it with the app, and the bike will unlock itself. Ride to your destination, place the bike out of the way in a public area, latch the wheel lock, and go on your way. Your ride will be billed based on the length of time the ride lasted. Cost to people: Rides cost $1 per half hour of riding time. Cost to the town: There is no direct cost to the town. Maybe. If you drive to Milton Station and pay for parking, that will cost you $6 per day, plus train fare. If you rent a bike share bike instead, you would spend $2 on the bikes and nothing for parking, for a net savings of $4 per day. You would also save a small amount of gasoline. What are the benefits of bike share? I don’t like to bike with car traffic. Where can I ride safely? Different people have different comfort levels. Milton has worked to add bike lanes on many streets, but if you are not comfortable biking on main roads, you may consider using side streets, the Neponset River Greenway trail, the Pine Tree Brook Path, Turners Pond Path or Cunningham Park trails instead. Also see our Bike Safety page for more information. What if it gets a flat tire? Bike share bikes use airless tires and cannot get flat tires! Why is there a bike out by the street? Just like cars, bicycles can be parked on public property. Dockless bikeshare bikes lock their rear wheels when not in use, so they do not need to be locked to a bike rack or other object. Can I take the bike home with me? Yes, but the terms of the agreement require leaving the bike outdoors in a public space so anyone can use it after you're done. If you take it indoors, your account may be penalized or locked out, or the bike may emit an annoying sound. Milton bylaws prohibit bicycling on sidewalks in business districts, but allow it across the rest of town. If you do bike on sidewalks, be sure to yield to pedestrians, walk your bike in business districts (East Milton Square and Milton Village), and be careful of cars pulling out of driveways and side streets. Can kids ride bike share bikes? These bikes are sized for adults, and contract terms call for users to be 16 or older. Massachusetts state law requires people aged 16 and under to wear a helmet while biking on public ways. If you are over 16, it is up to you whether to wear a helmet. We do recommend wearing a helmet if you are riding on streets. Local shops such as Ashmont Cycles in Dorchester, Landry's Bicycles in Braintree, and Dedham Bikes carry helmets. And we give away kids bike helmets at some local events, courtesy of our sponsor, Breakstone White & Gluck. Do the bike share vendors carry liability insurance? Yes, they are fully insured. Why don't all bikes need to carry insurance? A typical person riding a bike generates 1/3 of a horsepower, while a typical car generates 300. Since bicycles are 1000 times less powerful and can cause that much less damage, there is that much less need for insurance. Does the town get paid by the bike share vendor? Not yet. But the town may collect fees from the vendors for permitting or for failure to meet obligations. The current plan is to waive the fees for the first year to help the vendor become established, and to gauge the need for additional regulations moving forward. Dockless bike share systems are start-ups and are not yet profitable in this market. But the benefit to the town is that the town does not have to pay to set up its own transportation service. For example, Arlington was considering spending $243,000 to set up fifty Hubway bicycles and five docking stations, with a net income of $71,000 and a payback period of 3.5 years. We do not see a way for Milton to spend this kind of money on a transportation service. But if private companies want to take that risk, we will partner with them for the benefit of the community. Why do bikes get to use the roads when they don't pay excise tax? Public roads are only partially financed by excise taxes. Fuel taxes actually contribute more to our roads than the excise tax does. And yet, fuel taxes shrink each year because of inflation. Over the past twenty-five years, the gas tax has only been raised once, so these days fuel and excise taxes only cover about 60% of road maintenance costs. The rest comes from other sources, like income and property taxes, so people who don't drive cars actually pay more than their fair share for the roads. Road wear is roughly proportional to the fourth power of the weight of the vehicle. So by far the most road wear comes from trucks and cars - a bicyclist causes about 0.001% as much road wear as a car does. For example, if you look at the old section of Route 128 in the Blue Hills that was abandoned in 1959, you'll see that six decades after cars and trucks were replaced by pedestrians and bicyclists, the road surface is still in excellent condition. Bicyclists are actually saving the town money. And finally, the state is providing the town with a $396,703 Complete Streets grant next year, exclusively to improve safety for pedestrians and bicyclists.